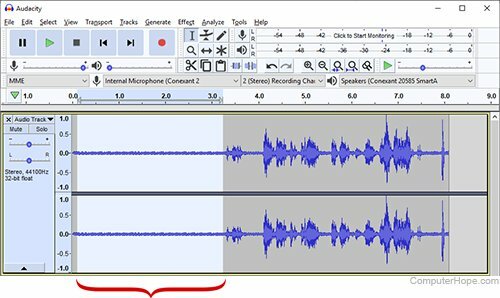 Audacity’s Noise Reduction tool can help you remove ambient background noise from recorded audio. For instance, if you record a guitar performance, but an air conditioner was running in the background, the tool can try to isolate that noise and remove it from the recording. Noise reduction works best if you have a few seconds in your recording where only the background noise can be heard. Alternatively, if you have sections of audio that you want to make silent, you can do so quickly, with a single key combination. Below are steps for removing unwanted noise from your recordings in Audacity, or silencing ambient sections. To begin, create a track and record your audio, or open a previously recorded audio file. If you have a section of audio that you want to reduce to complete silence, follow these steps. Highlight the unwanted portion of your track using the cursor. Silence the selection using the Ctrl+L keyboard shortcut (⌘+L on macOS). 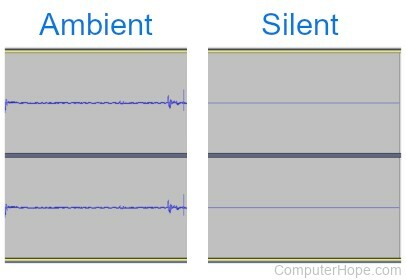 The silenced audio appears as a flat horizontal line, indicating that all audio data has been erased for that section of the audio. To filter ambient noise with the Audacity Noise Reduction tool, follow these steps. In an Audacity track, Highlight a segment of the audio (at least two seconds, if possible) that contains only the ambient noise. Select the Noise Reduction effect from the Effect menu. Select Get Noise Profile to sample the noise. Highlight the section you need the noise removed from. Change the Noise reduction (dB) slider to change the volume of the noise. Change the Sensitivity to determine what range of sounds it will filter out. Select Preview to listen to your audio, and make necessary changes to the dB and Sensitivity.